Mischief Theatre return with yet another side-splitting comedy, this time in the style of a diamond heist. The Comedy About a Bank Robbery follows eight inept crooks as they attempt to steal a large diamond from under the nose of a sleeping security guard. Created by the comic masters behind Mischief Theatre, their latest play offers plenty of pranks and laugh-out-loud moments, enjoyable for all ages. The Criterion Theatre Box Office is located within the theatre building in Piccadilly Circus and is open Tuesday-Saturday from 10am and Sunday from 11:30am. The Box Office is closed on Monday. Pre-purchased tickets can be arranged for collection at the theatre’s box office an hour before the show starts. If you plan to collect your ticket you will need the card you used to make your purchase along with your booking reference. London’s Criterion Theatre has had a very varied history, “going dark” several times, whilst changing performance genres. Originally built in 1973, the venue was intended as a concert hall, adjoined to a restaurant. Eventually, the decision was made to convert the building into a theatre, with initial productions including An American Lady and Topsyturbeydom (1874), neither of which were huge successes. Soon, the theatre began to host Edwardian musical comedies, a hugely popular genre in the West End at the time. Under the management of prolific theatre manager Charles Wyndham, who took charge of the theatre between 1875 and 1899, the Criterion began to establish itself as one of London’s more successful venues, with productions such as The Great Divorce Case (1876), Foggerty’s Fairy (1881) and Haste to the Wedding (1892). The Criterion Theatre continued to house productions between the World Wars, including Musical Chairs, starring John Gielgud, and Terence Rattigan’s French Without Tears (1936), which ran for an impressive 1,039 performances. During World War II, the venue closed down and became a safe studio for the BBC, who broadcasted news and light entertainment. In the 1970’s, the theatre was threatened with redevelopment, but was met with public protest. Post-War productions included Samuel Beckett’s Waiting for Godot (1955) and Anouil’s comedy The Waltz of the Toreadors (1956). Property tycoon Robert Bourne purchased the theatre in the 1980’s, housing productions such as Tom Foolery (1980-1981), Can’t Pay? Won’t Pay! (1981-1982) and Run for Your Wife (1983-1989). From 1996 to 2005, the Reduced Shakespeare Company played The Complete Works of William Shakespeare (Abridged) to rave reviews and acclaim, before being replaced with Jon Buchan’s popular stage adaptation of Alfred Hitchcock’s The 39 Steps, which ran at the theatre for 9 years. Follow the closure of The 39 Steps, Menier Chocolate Factory’s production of Close To You: Bacharach Reimagined (2015-2016) transferred to the Criterion. 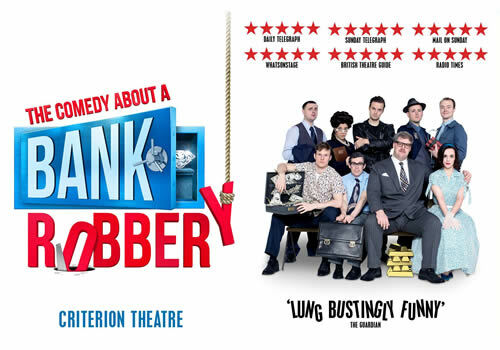 In 2016, Mischief Theatre’s brand-new comedy The Comedy About a Bank Robbery (2016) transferred and continues to this day. Occasional small productions continue to play alternate performances at the venue, including Mr Popper’s Penguins (2016).